A batch connection is a special type of connection that specifies a list of saved connections to run in sequence. This allows connections to be quickly and easily opened to multiple remote systems across multiple hops. 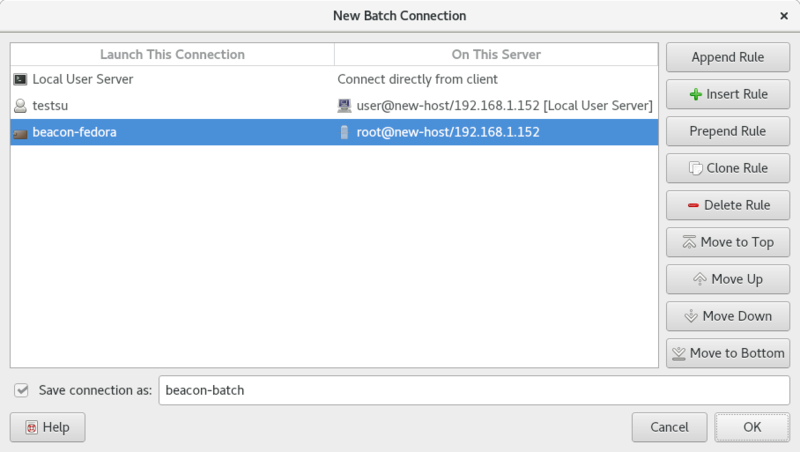 A batch connection can even contain other batch connections. Each of the latter two connections is run from the server made available by the previous connection in the list. In this way, a TermySequence connection to the container can be established in a single operation. The connections in a batch connection are not required to depend on each other. In addition to opening connections across multiple hops, a batch connection can be used simply as a means to open many connections at once. When opening a batch connection, each connection in the list will be opened in sequence using individual tasks. Connections that are already established will be skipped. A connection status dialog will be shown for each connection to collect passwords if necessary. A failed connection will stop the sequence. The ordered list of connections to open. Click an entry to edit it. A read-only column showing each connection's configured LaunchFrom setting as a convenience. Saves changes made in the dialog. This button is only present when editing a saved connection from the Manage Connections window. Discards changes made in the dialog. This button is only present when editing a saved connection. Specify a name to save the connection as. This element is not present when editing a saved connection.